focused chapters that will be fundamental to effective teaching in inclusive classrooms. "High Leverage Practices for Inclusive Classrooms would be useful for teachers at all levels. Beginning special educators will find the text well-organized and easy to read. The chapters on instruction provide specific research-based interventions for inclusion in undergraduate and graduate methods courses. Practicing teachers, even those with many years’ experience, will find practical ideas in the chapters on collaboration." "As a landmark practical resource for high leveraged practices based on scientific evidence for high incidence populations, this book is a must have for understanding how to best instruct students with disabilities while addressing the accountability demands of the field of special education. The introduction of high leveraged practices will long serve as an umbrella for new and existing educational initiatives, such as MTSS and PBIS." 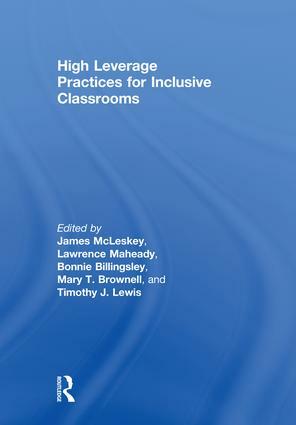 "High Leverage Practices for Inclusive Classrooms is a must-have for all educators, leaders, and service providers working in general education inclusive classrooms. The book provides a wealth of resources, practical examples, tips, summaries, and relevant research sure to make the work of educators more efficient, engaging, effective, and responsive to the needs of students in inclusive classrooms. I will encourage all preservice and inservice teachers with whom I work to have a copy in their professional library. I want to thank the editors and authors for creating a publication that will be such an asset to the field of education and all those who work in it." James McLeskey is Professor in the School of Special Education, School Psychology, and Early Childhood Studies at the University of Florida. Lawrence Maheady is Professor and Horace Mann Endowed Chair in the Exceptional Education Department at SUNY Buffalo State. Bonnie Billingsley is Professor of Teaching and Learning at Virginia Tech. She teaches in both the teacher preparation and doctoral programs at Virginia Tech. Mary T. Brownell is Professor of Special Education at the University of Florida and Director of the Collaboration for Effective Educator Development, Accountability and Reform (CEEDAR) Center. Timothy J. Lewis is Professor of Special Education at the University of Missouri. Dr. Lewis is the Associate Editor of the Journal of Positive Behavior Interventions and is a member of thirteen other editorial boards.